These power steering cylinders use the ship’s engine(s) to provide the “power” for the steering system, via an engine or electric motor driven hydraulic pump. Features effortless steering from docking to top speed. SeaStar Power Steering provides super responsive automotive style steering performance for todays’ large motor yachts. 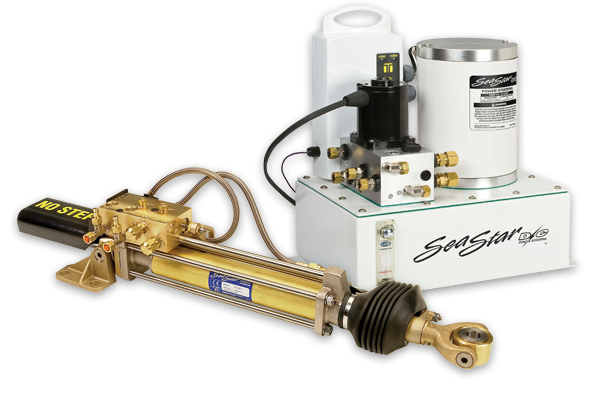 The SeaStar DC Power Steering Unit is the heart of the system providing reliable and economical hydraulic flow to the steering cylinder whenever the wheel is turned. Whether docking or cruising at high speed, the system will deliver 100% power regardless of engine speed. SeaStar’s superior design and selection of materials, precision manufacturing and rigid quality control all add up to an outstanding robust and versatile system for all large boat applications. • Highly responsive, effortless steering performance at all speeds. • Low number of turns lock to lock (based on helm selection). • Few components to spec and install. • Suitable for multi-station applications. • Suitable for use with most SeaStar helms (including tilt versions). • Automatic manual back up system. Covers most power steering requirements. No need to determine required flow rate, engine pump spec, engine connectivity. The system is economically powered from the boats 24v supply. During service and/or installation a semi-auto purge feature is engaged dramatically reducing installation time and air in the system. Totally self-contained, there is no longer any need to install separate filters, coolers, engine pumps, flow control valves. The DC power unit covers all requirements within one easy to install module. Provides the maximum required hydraulic oil flow, at all engine speeds. The DC Power Unit only draws power when a turn is initiated (typical duty time 5-10%). This ensures minimal power consumption, no wasted energy and longer filter and motor life. The system includes a secondary pump with adjustable flow that can be controlled by most autoplilot controllers. 4 hoses required. 1x port, 1x starboard, 1x reservoir supply, 1x reservoir return. Port/Starboard lines:  Use standard Seastar or Seastar Pro hoses, part numbers HO51xx or HO57xx **. Reservoir supply and return lines: Use standard Seastar, Seastar Pro, or Seastar nylon tubing. 4 hoses required. 1x port, 1x starboard, 1x high pressure supply, 1x low pressure return. **The use of Pro hose will improve steering response on all applications and is highly recommended on high performance applications or those using runs of 40’ or more. Do not use nylon tubing for helm port and starboard lines. 3/8” (max) copper tubing may be used for all helm lines.